Adhesive capsulitis (frozen shoulder) is a condition in which the glenohumeral joint capsule becomes contracted and adherent to the humeral head. This can result in shoulder pain and a reduced range of movement in the shoulder joint. It affects approximately 3% of the population, it is more common in women, and it peaks between 40-70yrs old. Those who have previously been affected by adhesive capsulitis are also susceptible to developing the condition in the contralateral shoulder. Adhesive capsulitis is often associated with inflammatory diseases and currently theory suggests that it may have an autoimmune element. Classically, adhesive capsulitis progresses in three stages (an initial painful stage, a freezing stage, and finally a thawing stage), however, there is little evidence to support these phases and the pain associated with limitation in shoulder movement is thought to be present throughout. Patients will describe a generalised deep and constant pain of the shoulder (which may radiate to the bicep), that often disturbs sleep. Associated symptoms include stiffness and a reduction in function. On examination, there may be a loss of arm swing and atrophy of the deltoid muscle. Generalised tenderness on palpation is common, with poor localisation of pain. The most characteristic features are found when examining range of motion. The patient will have a limited range of motion, principally affecting external rotation and flexion of the shoulder (a full range of motion should prompt consideration of alternative differential diagnoses). 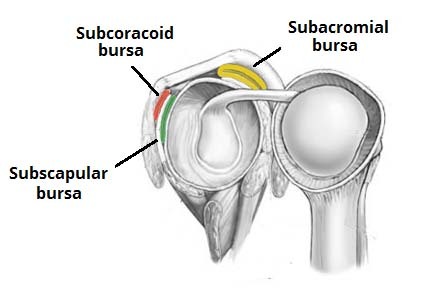 The diagnosis of adhesive capsulitis is typically a clinical one. Plain film radiographs are generally unremarkable, but importantly can be used to rule out acriomioclavicular pathology and atypical presentations of fractures. 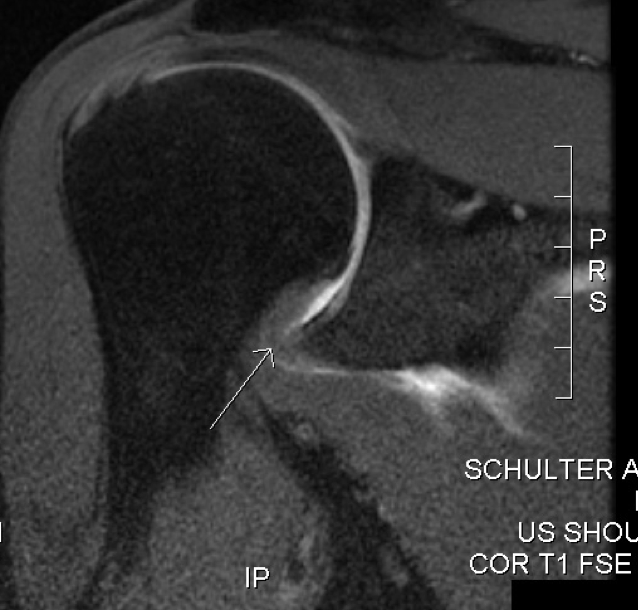 MRI imaging can reveal a thickening of the glenohumeral joint capsule in adhesive capsulitis (Fig. 2), but also can be used to rule out other conditions affecting the shoulder, such as subacromial impingement syndrome and plain radiographs. An HbA1c with a blood glucose may be useful for diagnosis of any underlying diabetes mellitus or glucose intolerance. Adhesive capsulitis is a self-limiting condition however recurrence is not uncommon. Recovery usually occurs over months to a few years and a proportion of patients will never recover full range of movement. Initial management of the patient involves education and reassurance. Patients should be encouraged to keep active; all patients should receive physiotherapy and advice concerning appropriate shoulder exercises. Management of pain initially begins with paracetamol and NSAIDs. Glenohumeral joint injections and oral corticosteroids may be considered for those patients failing to improve. No improvement following three months of conservative treatment or symptoms significantly affecting quality of life may benefit from surgical intervention. Potential surgical interventions include joint manipulation under general anaesthetic to remove capsular adhesions to the humerus, arthrogaphic distension or surgical release of the glenohumeral joint capsule. A proportion of patients will never regain a full range of motion but will regain movement beyond that required to perform activities of daily living. In some patients the progression of symptoms may persist beyond two years and adhesive capsulitis may recur in the contralateral shoulder. Which endocrine disorder is most associated with adhesive capsulitis? What is the characteristic feature of adhesive capsulitis on MRI? Which of the following is a surgical intervention for adhesive capulsitis?